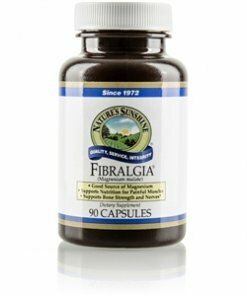 Nature’s Sunshine Fibralgia® nourishes the muscular system to alleviate muscle discomfort and fatigue. Fibralgia includes malic acid and magnesium, nutrients that provide key muscular support. Malic acid helps produce cellular energy while magnesium encourages proper absorption of nutrients that strengthen the bones and balance nerve impulses. These nutrients help the body maintain the energy production it needs so it doesn’t break down muscle protein to create energy. Maltodextrin, silicon dioxide (powdered silica), gelatin and water.